WiFi is a great technology, one that tends to be under-appreciated until we find a place that doesn’t have it or that we can’t get into. WiFi broadcasts out into a room or building, allowing any number of devices to connect to the Internet through the airwaves. But WiFi is not perfect and can be impeded by things like metal mesh in the walls, furniture, etc. Sometimes a room can have an excellent connection in one space, while being practically a deadzone in another part of the room. NetSpot is a nice little app that can help you determine what the WiFi is like in a room. NetSpot is pretty straightforward. When you launch the app, it will ask you for a map. If you’ve created or already have a layout of the room you’re going to be analyzing, this is where you can load it up. These maps can just be simple JPEG’s that you’ve created in Photoshop or another similar program. If you don’t have a prerendered map, NetSpot will let you draw a map of the room in app, render a sample map, or let you create a blank map. A blank map is simply a blank square with no set lines marking furniture, floor plans, or any other markings besides denotations of the length and width of the room. Once you have chosen your map, you give NetSpot the length and width of the room. NetSpot generated map showing the number of access point available in my workroom. It seems like this room doesn’t have a whole lot to worry about. members or coworkers, NetSpot creates a visual map of the WiFi and various signals in your area. It also shows you which areas have the most interference and noise. You can even see which WiFi signals are strongest at which points in the room. Once you’re done, you can save it as a special NetSpot file to explore later or share with other NetSpot users. Fortunately you can also export it the various maps as PDF files to distribute to everyone, to hang up in an office, or deliver to an IT person. Unless you have a Macbook Air, walking around the room with your laptop may seem awkward and cumbersome. It would be cool to see an iOS counterpart that could work with the Mac client. Carrying something like an iPhone or iPad around a room would certainly make it easier. 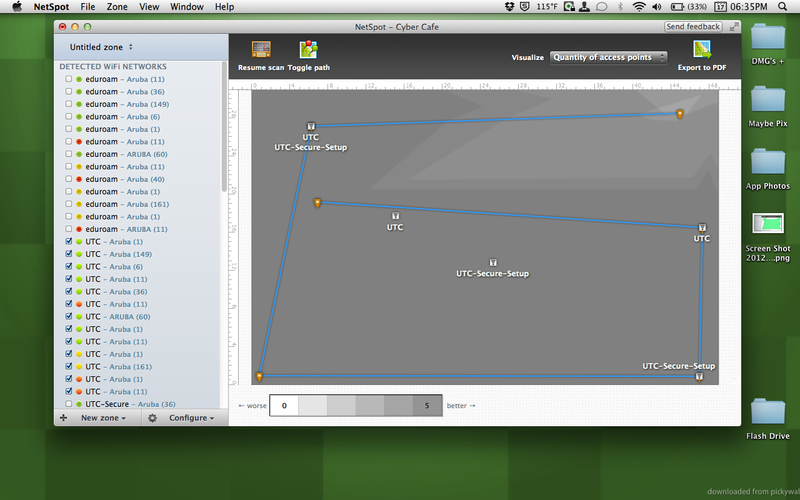 And when creating a blank map, I don’t get any gridlines to help me make sure I’m measuring in the most accurate way. That being said, the app still has a really straightforward user interface and makes it easy for anyone to understand the maps. I also have to gives props to the developers though, they are really good about answering emails and helping users solve their problems. A good app is greatly complemented by helpful developers and community. Whether you’re setting up a new WiFi network or wanting to improve you’re current one, NetSpot makes for a great little tool for helping you get the most out of your WiFi. NetSpot is a free app from the NetSpot Team a part of Etwok, LLC. The app runs on OS 10.6.6 and higher (Snow Leopard and later) and can be downloaded from the Mac App Store or from their website http://www.netspotapp.com/. If you have any questions, comments, or suggestions about this or any other topic, leave a comment below or email us at easyosx@live.com You can also check us out on Facebook, Twitter, and YouTube by hitting the buttons on the top of your screen. And check out our Google Plus. Thanks! Like what you see? Want to keep up with what goes on here? Follow this blog and get email updates.